We've been stuck in a quagmire on individual wind turbine efficiency, meaning wind energy is now a mature technology that is not really a viable mass solution for replacing fossil fuels. But California Institute of Technology researchers have revisited some of the fundamental assumptions that guided the wind industry for the past 30 years, and now believe that a new approach to wind farm design, one that places wind turbines close together instead of farther apart, may provide significant efficiency gains. This challenges the school of thought that the only remaining advances to come are in developing larger turbines, putting them offshore, and lobbying for government policies favorable to the further penetration of wind power in energy markets. Current thinking, increasing height and size, leads to frequently cited issues such as increased cost and difficulty of engineering and maintaining the larger structures, along with visual, acoustic, and radar signatures problems, not to mention more bat and bird impacts. "What has been overlooked to date is that, not withstanding the tremendous advances in wind turbine technology, wind 'farms' are still rather inefficient when taken as a whole," explains John Dabiri, professor of Engineering and Applied Science, and director of the Center for Bioinspired Engineering at Caltech. "Because conventional, propeller-style wind turbines must be spaced far apart to avoid interfering with one another aerodynamically, much of the wind energy that enters a wind farm is never tapped. In effect, modern wind farms are the equivalent of 'sloppy eaters.' 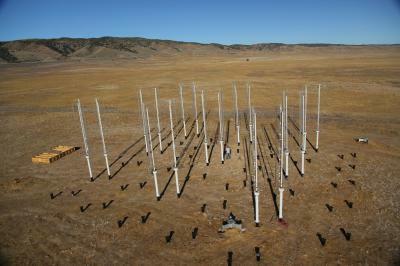 To compensate, they're built taller and larger to access better winds." Dabiri is focusing on a more efficient form of wind 'farm' design, relegating individual wind turbine efficiency to the back seat. He describes this new design in the American Institute of Physics' Journal of Renewable & Sustainable Energy. "The available wind energy at 30 feet is much less abundant than that found at the heights of modern wind turbines, but if near-ground wind can be harnessed more efficiently there's no need to access the higher altitude winds," he says. "The global wind power available at 30 feet exceeds global electricity usage several times over.The challenge? Capturing that power." Research at the Caltech Field Laboratory for Optimized Wind Energy, directed by John Dabiri, suggests that arrays of closely spaced vertical-axis wind turbines produce significantly more power than conventional wind farms with propeller-style turbines. The Caltech design targets that power by relying on vertical-axis wind turbines (VAWTs) in arrangements that place the turbines much closer together than is possible with horizontal-axis propeller-style turbines. VAWTs provide several immediate benefits, according to Dabiri, including effective operation in turbulent winds like those occurring near the ground, a simple design (no gearbox or yaw drive) that can lower costs of operation and maintenance, and a lower profile that reduces environmental impacts. Two of the primary reasons VAWTs aren't more prominently used today are because they tend to be less efficient individually, and the previous generation of VAWTs suffered from structural failures related to fatigue. "With respect to efficiency issues, our approach doesn't rely on high individual turbine efficiency as much as close turbine spacing. As far as failures, advances in materials and in predicting aerodynamic loads have led to new designs that are better equipped to withstand fatigue loads," says Dabiri. Field data collected by the researchers last summer suggests that they're on the right track, but this is by no means 'mission accomplished.' The next steps involve scaling up their field demonstration and improving upon off-the-shelf wind turbine designs used for the pilot study. Ultimately, the goal of this research is to reduce the cost of wind energy. "Our results are a compelling call for further research on alternatives to the wind energy status quo," Dabiri notes. "Since the basic unit of power generation in this approach is smaller, the scaling of the physical forces involved predicts that turbines in our wind farms can be built using less expensive materials, manufacturing processes, and maintenance than is possible with current wind turbines." A parallel effort is underway by the researchers to demonstrate a proof-of-concept of this aspect as well.